The Long-Term Care Imperative conducted a statewide poll last fall to learn more about what Minnesotans think about senior care. 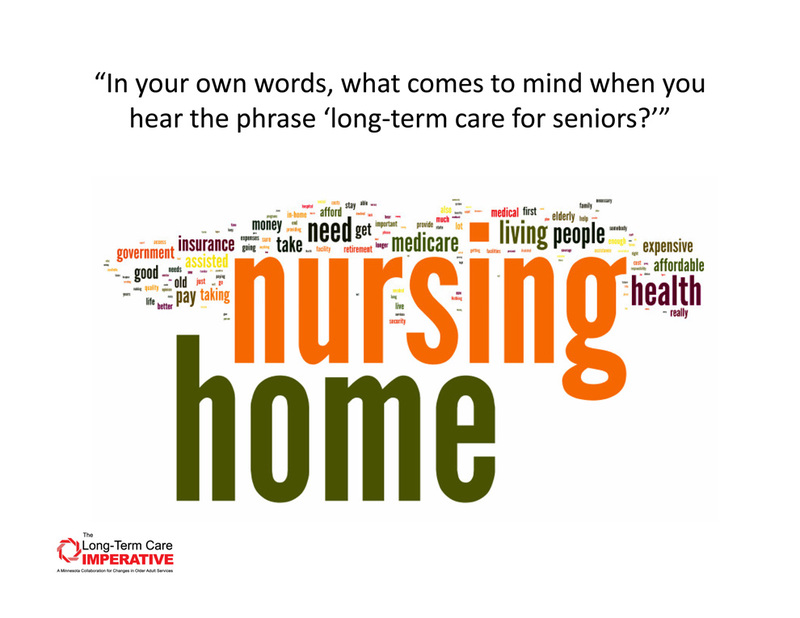 Pretty interesting – overwhelmingly, people think “nursing home” when they think about long-term care. Even more interesting is that nursing homes are actually the least common form of older adult services, reserved only for those with the most complex medical needs. Senior care in Minnesota is actually a diverse system of different kinds of support, resources to help people stay independent, care options based on an individual’s needs and wants, and variety of different housing and lifestyle choices. We need the whole system (not just one part of it) to be strong in order to meet the changing demands of our aging population. Below is an infographic developed by the Long-Term Care Imperative to demonstrate a few of the ways Minnesotans access senior care and the journey many people go on as their needs change. What do you think – does this represent your experience? What needs to change to make it easier for Minnesotans to get the care they need when and where they need it?